Waterfall charts can be a really useful tool to for certain types of data plotting. 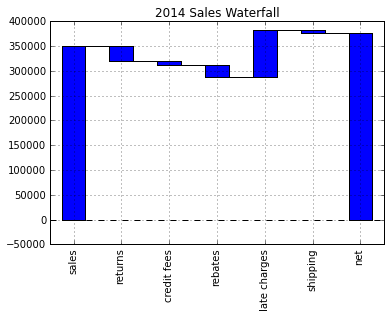 Not surprisingly, we can use pandas and matplotlib to create a repeatable waterfall chart. Before I go any further, I want to level set with everyone about which type of chart I’m referring to. 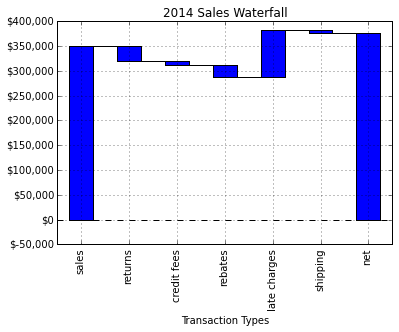 I will be building a 2-D waterfall chart described in this wikipedia article. A fairly typical use for a chart such as this is to show what the + and - values are that “bridge” between a start and end value. For this reason, finance folks will sometimes refer to this as a bridge. Like the other examples I’ve used, this type of plot is not easy to generate in Excel. There are certainly ways to do it but it is not easy to remember. 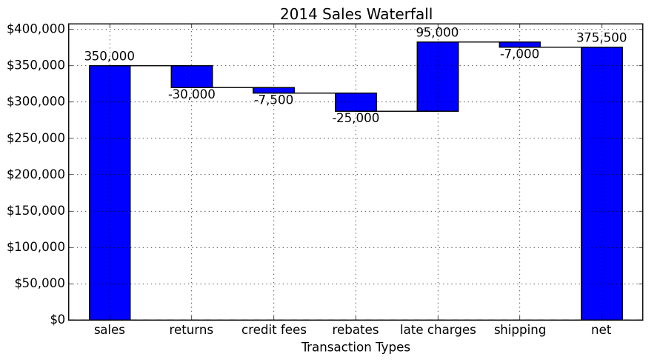 The key thing to keep in mind with a waterfall chart is: at its heart it is a stacked bar chart. The “special sauce” is that you have a blank bottom bar so the top bar “floats” in space. Let’s get started. Execute the standard imports and make sure IPython will display matplot plots. Setup the data we want to waterfall chart and load it into a dataframe. The data needs to start with your starting value but you leave out the final total. We will calculate it. I am using the handy display function in IPython to make it easier to control what I want to display. First, let’s get the cumulative sum. This looks good but we need to shift the data one place to the right. We need to add a net total amount to the trans and blank dataframe. Create the steps we use to show the changes. For the net row, we need to make sure the blank value is 0 so we don’t double stack. That looks pretty good but let’s try formatting the y-axis to make it more readable. We use FuncFormatter and some of the python 2.7+ syntax to truncate decimals and add a comma to the format. If you were not familiar with waterfall charts, hopefully this example will show you how useful they can be. I imagine that some people may think that this is an awful lot of scripting for one chart. I agree - in some respects. If you will only do one waterfall chart and never touch it again - stick with an Excel solution. However, what if the chart is really useful and now you need to replicate it for 100 customer? What would you do next? Using Excel would be a challenge. Using this script to create 100 different charts would be fairly easy. Once again, the real value of this process is building an easily repeatable process when you need to scale the solution. I am really enjoying learning more about pandas, matplotlib and IPython. I am pretty happy with how this solution has turned out and I hope others can learn a little bit too and apply this lessons to their daily jobs.